A Mid-Life crisis from Hell is being scratched out for theatre goers with a farce of a man reaching 50 and wanting another ‘last fling’. 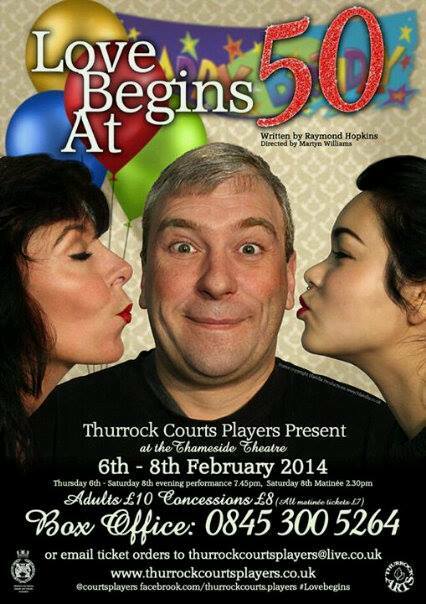 It all happens at the Thameside Theatre in central Grays Town in February with Thurrock Court Players production of ‘Love Begins at 50’.. The last fling is after 28 years marriage and the approach of his 50th birthday, but Clive looks back as life races past without any added sparkle. He digs into the lonely hearts section of the local paper and selects three potentials, setting up interviews with all of them. The Yang side of this Ying is his faithful wife, Anita, enters the same newspaper for a competition to find the happiest married couple with the top prize of a Caribbean cruise. With his wife away, the ingredients are well and truly mixed when Clive is photographed by the local newspaper with one of his potentials, unaware that his wife had won the cruise. It has all the elements of large numbers of slamming doors and heart stopping moments depending where your sympathies lay.